It’s a box of biscuits. 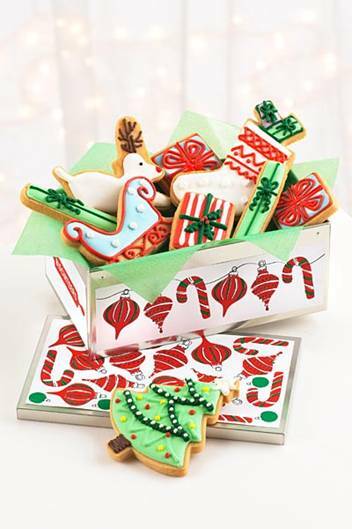 Hand-made, hand-decorated biscuits, in a nice tin box. This is Interflora’s new idea. Instead of sending a bunch of flowers, you now get the chance to send a box of biscuits instead. It’s a good idea. Gives people options. Indeed it does. This is their Christmas-themed biscuit box, packed with Christmas tree shaped biscuits, reindeer shaped biscuits…you get the idea. What are the biscuits like? They look superb. Very well made and decorated. Somebody took real pride in making these biscuits, and it shows. The biscuits themselves are light, crumbly and tasty, but there’s a lot of icing on top, which tends to overpower the whole thing. No, it doesn’t. I couldn’t eat more than a couple at once, but, as the saying goes, it’s the thought that counts. Twenty-four pounds and ninety-nine pence. For a box of nine admittedly rather nice biscuits. Postage costs another £5.99 on top of that, so this will cost you over thirty quid to get it into the hands of the object of your affections, which does seem an awful lot. The recipient doesn’t need to know the cost, so if you’re happy to pay it, it’s a good alternative to a bunch of flowers. Interflora’s food and drink gifts are here. Looks like similar product to what you can buy on the Biscuiteers website (similarly pricy but they are good biscuits!) I think Interflora should stick to flowers, and what is the £5.99 delivery charge about? Ridiculous! thegooddr – it's the same product, made by Biscuiteers. I agree on the delivery – it's way too high at £5.99. They look lovely but I would seriously struggle to pay that price when I know I could probably make something very similar at home.